AminoMax products deliver highly consistent amino acid profiles, making them a valuable tool for dairy nutritionists. The reliability of the formula means that results are easy to predict and control using precise management techniques. Specifically, AminoMax products provide consistently high levels of bioavailable lysine, methionine and other essential amino acids. Nutritionists can custom-blend multiple bypass plant proteins to meet individual feeding goals using AminoMax Pro or AminoMax Green. In a Miner Institute trial released in 2013, cows that received a diet including AminoMax produced more milk, milk protein and milk fat than when they were fed the components individually. The cows also gained more weight, suggesting a high overall feed efficiency. Cornell University researchers have found that AminoMax has an impressive RUP value of 72%—far higher than either pretreated soybean meal at 49% or pretreated canola meal at 43%. As you know, canola meal has a unique amino acid profile that includes histidine, methionine, cysteine and threonine to very efficiently optimize milk production. 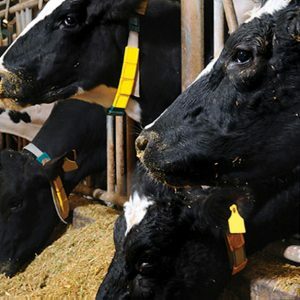 University researchers have shown at a meeting of the American Dairy Science Association that Holsteins fed an increasing forage-to-concentrate ratio—with canola meal as the main protein source—decreased DMI without altering milk yield. The Canola Council of Canada has also released a summary of 24 research trials showing that CM in dairy diets increased milk production by 2.2 pounds (one liter) each day. A product like AminoMax—which includes both canola meal and soybean meal that have been processed to obtain the highest bioavailability of key amino acids—is clearly a valuable tool for improving feed efficiency, reducing nitrogen, optimizing milk production and increasing milk components.